Pleural mesothelioma is a rare cancer often diagnosed in people who have been exposed to high levels of asbestos. The malignancy affects the pleura, a thin membrane of lubricating cells that lines the lungs and chest wall. It sometimes takes ten years or more for changes to appear that are indicative of pleural disease, and even longer for symptoms to manifest. These differences can include a thickening or calcification of the pleural lining—a condition commonly diagnosed as pleural plaques. Conditions like pleural calcification or the development of pleural plaques often serve as precursors to mesothelioma. In most instances, pleural disease is not considered fatal but it can cause diminished lung function and may confirm that a person has sustained significant asbestos exposure. Patients diagnosed with pleural conditions are generally considered to be at a higher risk for developing the more severe pleural mesothelioma. Pleural mesothelioma originates in the pleura but can quickly spread to the outer chest wall, abdomen, and heart. Pleural mesothelioma is typically fatal within one year of diagnosis. However, understanding and recognizing key risk factors, like asbestos exposure, will typically lead to early detection of the cancer. Those individuals who are fortunate to receive an early diagnosis are likely to be more eligible for life-sustaining treatments such as surgical resection of the cancer. This type of treatment can extend a patient’s life years beyond that of a typical mesothelioma patient. While there is no cure for pleural mesothelioma, treatment options do exist for this type of cancer. There are ways for patients to control the disease through tumor management including traditional radiation and chemotherapy methods. These methods can ease symptoms of the disease and make a patient more comfortable. In patients where a diagnosis is made of early stage disease, mesothelioma surgery can extend the survival rate far beyond previous levels in untreated disease. Nearly all patients diagnosed with pleural mesothelioma are able to receive some form of treatment for their illness. While there is currently no cure for mesothelioma, patients have been able to extend initial prognosis through advanced mesothelioma treatment regimens currently being developed at clinics and cancer centers across the United States. Surgical resection is difficult in pleural mesothelioma patients when the disease is diagnosed in later stages because at that time the tumor has typically metastasized to other areas of the body such as the abdominal cavity and lymph nodes. However, in early-stage diagnoses, surgery can absolutely be utilized to slow the advance of mesothelioma disease. Common surgical procedures utilized in the management of malignant mesothelioma are pneumonectomy and extrapleural pneumonectomy. Pneumonectomy is a general procedure conducted not only in patients with malignant mesothelioma, but in those battling lung cancers or related lung conditions. Pleurectomy involves the removal of either a portion of the lung or the entire affected lung in patients. Extrapleural pneumonectomy is a more comprehensive procedure that is typically tailored to mesothelioma patients and involves the removal of the entire affected lung, the pleura, the diaphragm, and the pericardium, which is the mesothelial lining that surrounds the heart cavity. Chemotherapy is likely the most prevalent treatment utilized by patients of malignant pleural mesothelioma. While several different chemotherapy drugs have been utilized to varying degrees of effectiveness for the management of malignant pleural mesothelioma, only one has been approved by the Food and Drug Administration as a prescribed therapy for the treatment of malignant pleural mesothelioma. A combination of Alimta(Pemetrexed) and Cisplatin is currently the only drug combination in approved status. However, several other clinical trials are currently active attempting to determine the effectiveness of other drugs including Gemcitabine, Navelbine, and Onconase. Radiation therapy has been utilized in the treatment of many types of cancer and pleural mesothelioma is no different. Often, radiation is not able to manage cancer by itself so it is combined with either surgery, chemotherapy, or both to augment the treatment plan as a whole. Radiation therapy for pleural mesothelioma utilizes external beam radiation to mutate tumor cells within the body and slow their growth and spread. A growing school in cancer care involves integrative approaches to the treatment of cancer. Integrative oncology utilizes not only the conventional therapies discussed above, but also untraditional therapies such as acupuncture, massage, and reflexology to assist the patient in managing pain, anxiety, and restlessness. Patients battling pleural mesothelioma have effectively utilized alternative therapies like these to increase the effectiveness of their treatment program overall. Generally, patients who are able to withstand the difficult side-effects of more potent chemotherapy and radiation treatments will be best able to extend their prognosis. Patients of pleural mesothelioma who have utilized alternative therapies have been able to do just that. However, most of these therapies are preferential and will depend on the health of the patient as to whether or not they will be able to engage in them. As with any treatment, patients should seek the consultation of their oncologist or cancer specialist before engaging in any alternative therapy. 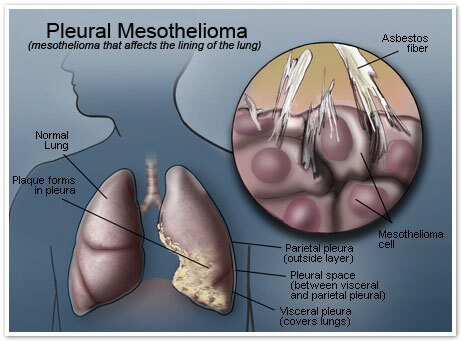 Pleural mesothelioma is known only be caused by exposure to asbestos. Asbestos is a naturally occurring and microscopic mineral that was used for hundreds of years in a number of different industrial compounds. Asbestos fibers are extremely durable, but also extremely difficult to expel from the body once introduced to the internal tissue. Upon inhalation, asbestos fibers will lodge on the outer layers of the lung tissue and within the pleura, a thin membrane of mesothelial cells which lines the chest cavity. This lining allows for the free movement of the body’s internal body structures because it provides a special lubrication to the surface of these structures. The pleura, like other mesothelial membranes, is a delicate structure and microscopic asbestos fibers can cause pleural plaques to form on its surface. Pleural plaques may eventually develop into pleural mesothelioma tumor cells. Generally, it takes many years between asbestos exposure and the development of adverse health complications, as the fibers will slowly irritate and inflame the internal tissue over time until symptoms appear. Many of those exposed to asbestos have successfully received compensation from asbestos product manufacturers for injuries and illnesses such as pleural mesothelioma. If you believe you were wrongfully exposed to asbestos and have developed an asbestos-related health complication, we urge you to complete the brief form on this page. We’ll rush you a complimentary mesothelioma and asbestos exposure information packet detailing advancements in the treatment of pleural mesothelioma, top doctors and cancer centers, and mesothelioma attorney options you may have.